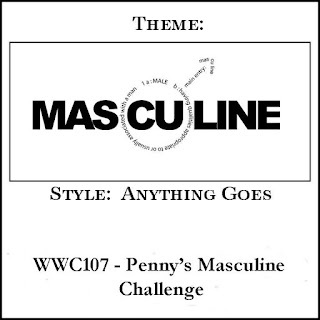 This week Penny is hosting our Masculine "Anything Goes" Challenge at Watercooler Wednesday Challenges. For my card, I decided to do little stamping and more die-cutting. 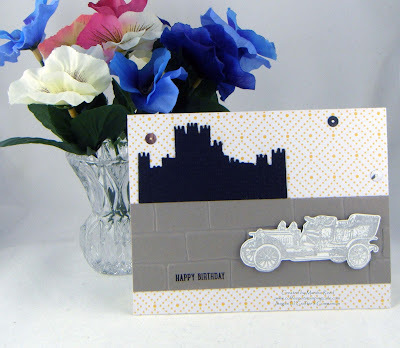 I'm a huge Downton Abbey fan and used some of my Crafter's Companion product for this design. The card base is Naturals White to which I added a layer of Cherry On Top Designer Series Paper Stack. First I cut a strip of Tip Top Taupe. I ran it through the Big Shot using the Brick Wall Embossing Folder and attached it to the card front. 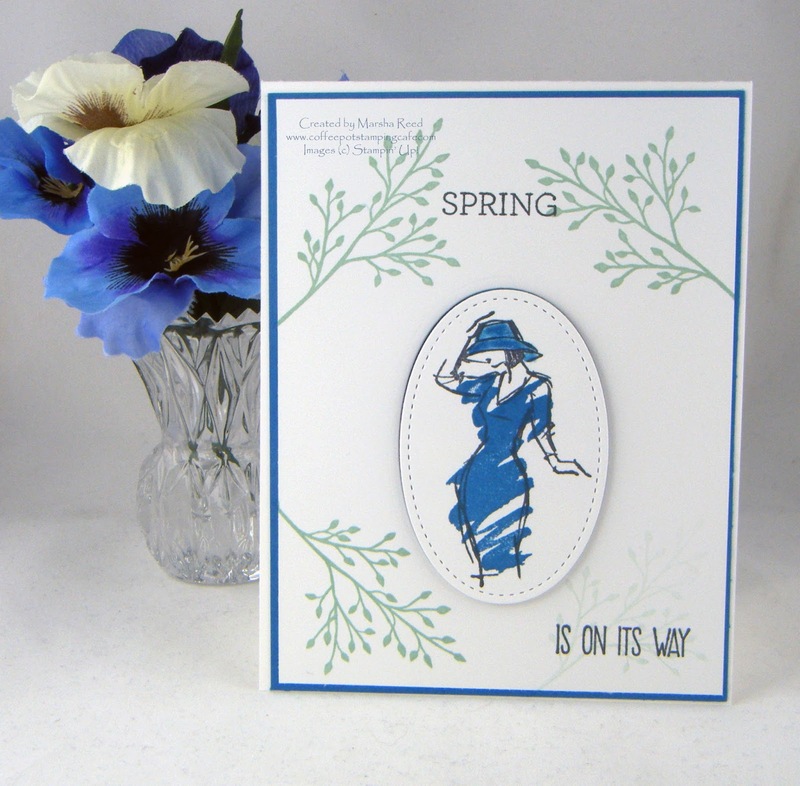 The silhouette is cut from Basic Black using the Downton Abbey Die. Then, I ran it through the Big Shot using the Square Lattice Embossing Folder. I placed it right on top of the Tip Top Taupe wall. The car is from the Downton Abbey Collection. It's stamped using Basic Black Archival ink. 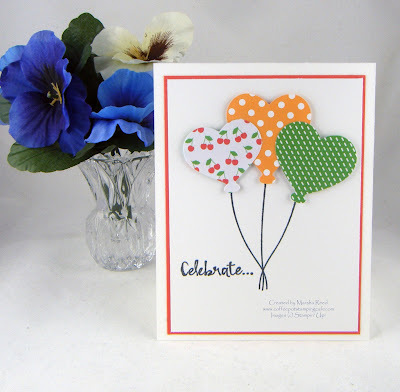 I did fussy cut it out and popped it up with Stampin' Dimensionals. What you cannot see well in the photo, is that I covered it with Clear Wink of Stella to give it a shimmer. That stuff is hard to photograph. 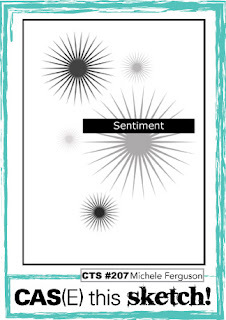 The sentiment is from the Sprinkles of Life stamp set and stamped in Basic Black Archival ink. A few silver sequins and it was all done. Most of the Stampin' Up!® is retired but I still love to go back and play with some of my favorites. For all the challenge details and to share your project, visit Watercooler Wednesday Challenges by clicking the image below. We'd love to have you join us. You have until Monday, February 27th at 6:00 p.m. Central Time to link your project. 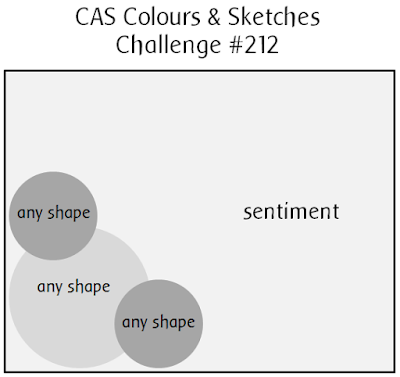 It's a color challenge at the CAS Colours & Sketches Challenge as well as my third week as a Guest Designer. And, it's another birthday card. I have quite a few birthdays coming up so it was time to get some more cards done and ready to send. Balloons are always good for birthdays. I cut two balloons out of the Cherry On Top Designer Series Paper Stack and one from the 2016-18 In Color Designer Series Paper Stack using the Hearts Balloons Dies from My Favorite Things. I added some Clear Wink of Stella over the balloons for a subtle shimmer. They sure are bright and cheerful in the Cucumber Crush, Peekaboo Peach and Watermelon Wonder colors. 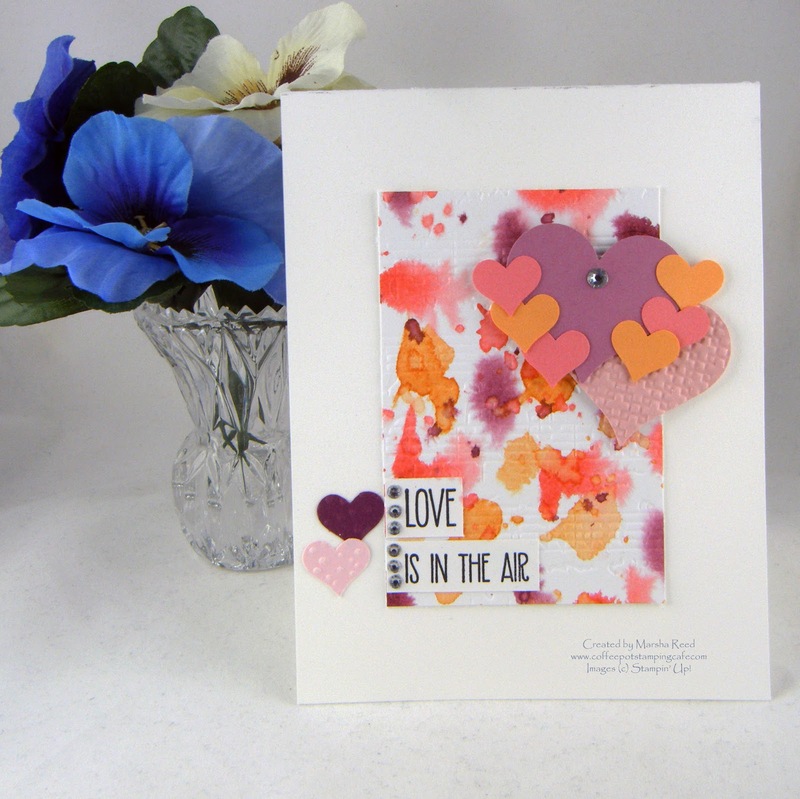 The card base is Whisper White Thick and attached a layer of Whisper White onto a layer of Watermelon Wonder. The strings for the balloons were stamped using Tuxedo Black Memento ink. 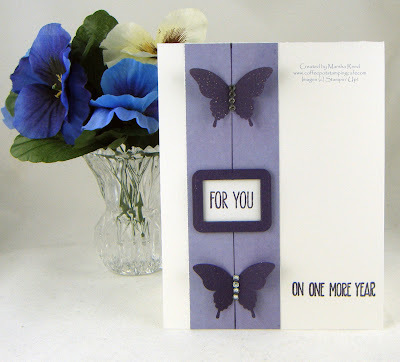 The sentiment is also stamped in Tuxedo Black Memento ink and is from the Beautiful You stamp set. 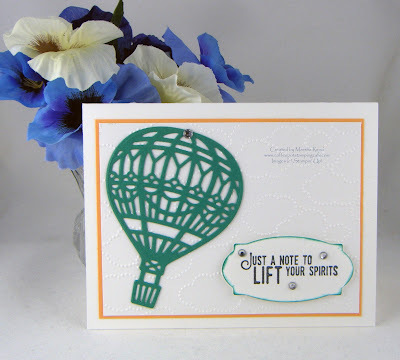 I popped up the balloons with some Stampin' Dimensionals. 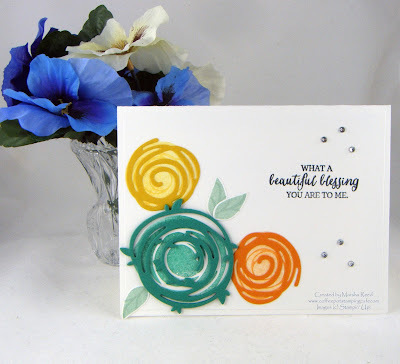 It's so exciting to share with you that I was selected to be a Guest Designer for this weeks' challenge at What Will You Stamp? I love challenges and being asked to design for them is such an honor. 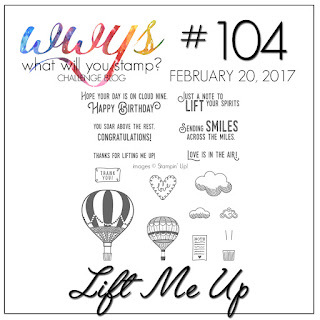 This week we are featuring the Lift Me Up stamp set. It's one I've not yet purchased so borrowed it from friend. Now that I've had the opportunity to play with it, it has gone on my ever lengthening wish list. 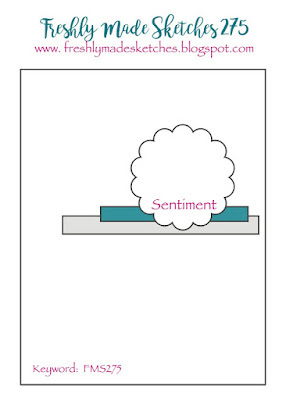 For my design, I made a scene of hot air balloons floating over the mountains. This was to be a practice card, which is why it's done on Naturals White retired cardstock. But, it turned out so well, that rather than starting over, I used it. First, I stamped the mountains from the In the Meadow stamp set in Basic Black Archival ink and colored them using the Early Espresso Watercolor Pencil. 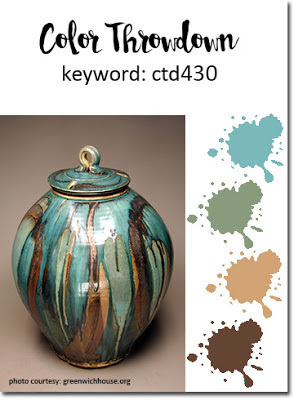 The meadow was sponged using Wild Wasabi and Pear Pizzazz inks. The grass was stamped using Old Olive ink as are the flowers. Using Stampin' Write Markers, I added Flirty Flamingo, Pink Pirouette and Rich Razzleberry inks to the blooms. Of course, I had to get my little Dapper Denim butterflies flitting around the flowers. 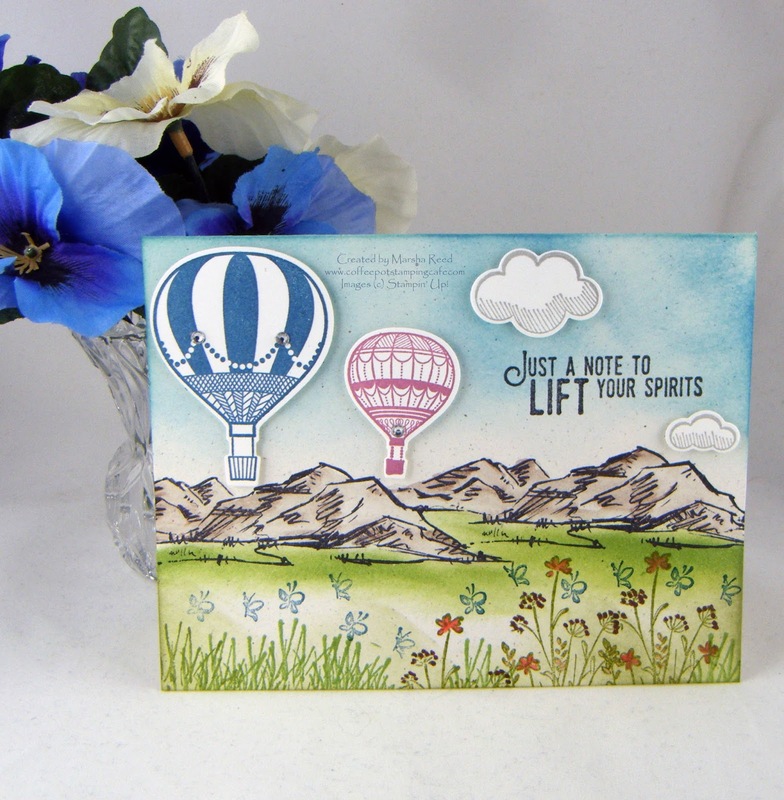 Using the Lift Me Up stamp set, I stamped the two balloon images onto Whisper White; one in Dapper Denim and one in Sweet Sugarplum. The clouds were stamped using Smoky Slate ink. Then, I cut the balloons and clouds out using the Up & Away Thinlits Dies. 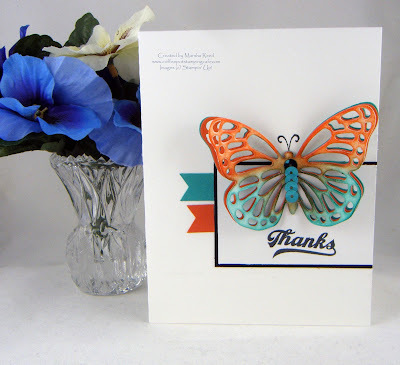 I attached them to the card base with Stampin' Dimensionals. I added a few Rhinestone Basic Jewels for the finishing touch. For all the What Will You Stamp? Challenge details and to share your project, click the image below. Welcome to our February Spring Fever Blog Hop. Each month, on the third Thursday of the month, a group of us get together to hop and share projects from Stampin' Up! 's current catalogs. It's always a lot of fun. Today's hop is all about Spring and I must say that this week in Iowa, with 60 degree temperatures, it's going to feel very springlike. You should be coming to my blog from Kath Ricks. After your visit with me, head on over to Libby Fens. And, as always, our Hop runs in a circle. Whether you start at the top and go forward or start at the bottom and go backward, you will always wind up where you started. With 60 degree temperatures here in Iowa for the next eight days, it's definitely feeling like Spring. I'm just hoping that we don't get a nasty March snowstorm. It's been known to happen. The projects I made all feature some aspect of Spring. It could be through a word or a flower or a vibrant color. That is all from me. The next stop on your tour is Libby Fens. To see her wonderful projects, click the image below. If you'd like to revisit Kath Ricks and see her great projects again, click the image below. What can I say, I love sparkle! Heidi is hosting the challenge this week. 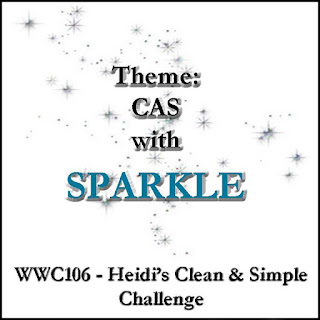 When I saw she had picked sparkle as the theme for her Clean And Simple (CAS) challenge, I knew exactly what I wanted to do. The base is Whisper White to which I added a layer of Crumb Cake. The flower is cut from glitter felt using the Tattered Florals Dies from Tim Holtz. To the center I added a burnished silver brad. It's a bit hard to see but the word sparkle is cut from Silver Glimmer Paper using a Taylored Expressions Die. And that, as the they say, is that! A very simple card that took no time at all to put together. And, you may have noticed that there is no stamping on the card. It's one destined for my note card shelf as I like to keep cards on hand to send to my grandchildren. My oldest granddaughter is to be the recipient of this one, eventually. For all the challenge details and to share your project, visit the Watercooler Wednesday Challenge by clicking the image below. We'd love to have you join us. 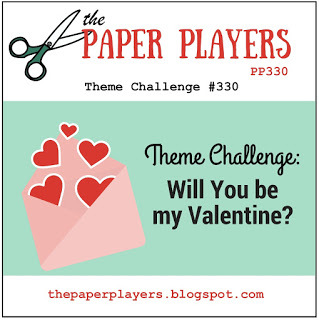 You have until Monday, February 20th at 6:00 p.m. Central Time to link your project. My second card as a Guest Designer for CAS Colours & Sketches Challenge, is a birthday card I made for my sister. She will be celebrating a milestone birthday and will turn 60 on February 16th. She loves purple so I always try to add the color somewhere on the cards I make for her. For this one, I attached a strip of Graphic 45's Secret Garden Patterned Paper to a Whisper White Thick card base. To be honest, I had planned to place a line of bakers twine down the center of the colored strip but forgot to add it before I attached everything. Instead, I drew a line using my Elegant Eggplant Stampin' Write Marker. It worked. On a piece of Whisper White I stamped the sentiment from the Jar of Love stamp set using Elegant Eggplant. Next, I cut it out using the Mini Frame 4 from Taylored Expressions. The piece I used is actually the center of the frame. I also cut one in Elegant Eggplant and placed the frame over the center cut using Stampin' Dimensionals. The butterflies are punched from Elegant Eggplant using the Elegant Butterfly Punch. I attached them using Tombow Multipurpose Glue. Down the center of each butterfly, I placed some Rhinestone Basic Jewels. 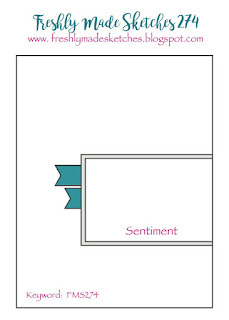 The sentiment on the lower right is from the Sunshine Sayings stamp set. Before I attached the frame and the butterflies, I spritzed them with some Radiant Rain Shimmering ICE Mist. It added just a wee bit of sparkle to the card. Today finds me with low energy but in the mood to create. 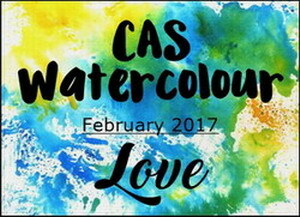 I found that I could combine these challenges, CAS(E) this Sketch, Just Us Girls and CAS Watercolour, for a cheerful card that could be used for Valentine's Day or an anniversary. To start, I did a bit of splotchy watercoloring on a piece of Watercolor Paper. The colors I used were Sweet Sugarplum, Flirty Flamingo and Peekaboo Peach. Once dry, I attached that layer to a card base of Whisper White Thick cardstock. 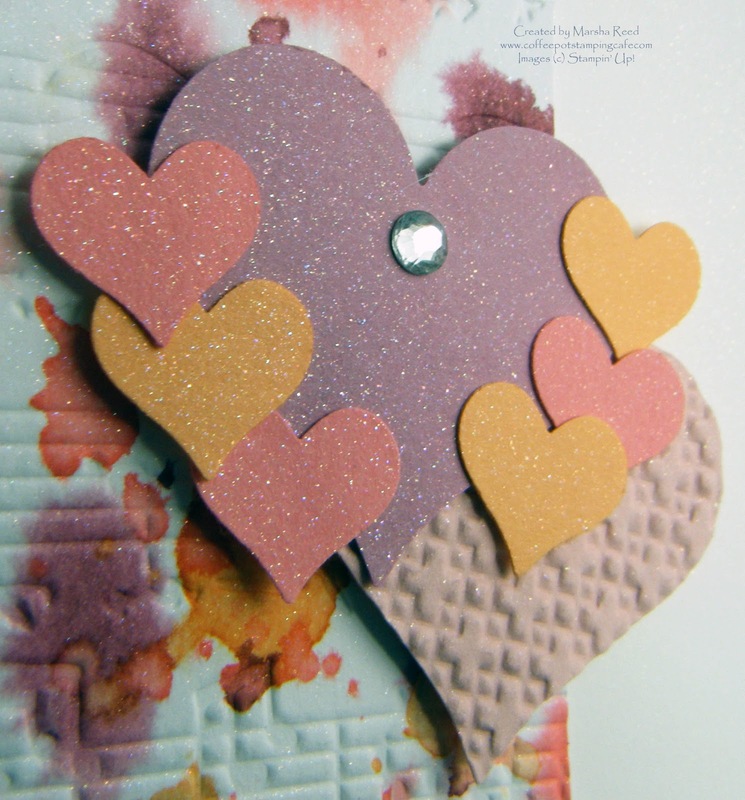 The large hearts were punched from Sweet Sugarplum and Blushing Bride. The Blushing Bride heart was embossed with the Square Lattice Embossing Folder. The little hearts were punched from Flirty Flamingo, Peekaboo Peach, Pink Pirouette and Rich Razzleberry using the heart from the Itty Bitty Accents Punch Pack. 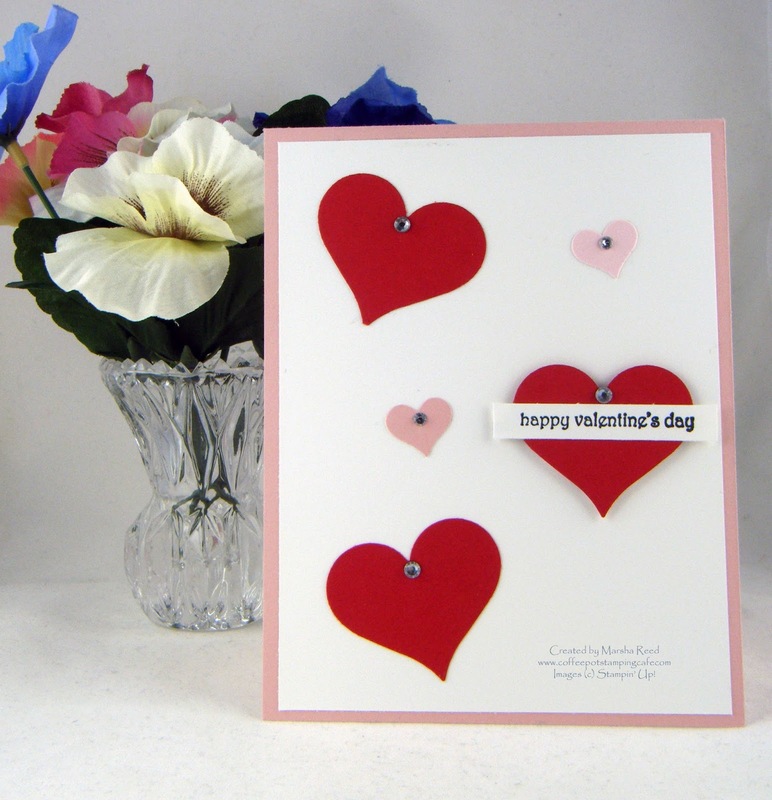 The two hearts on the lower left of the card were embossed using the Decorative Dots Embossing Folder. 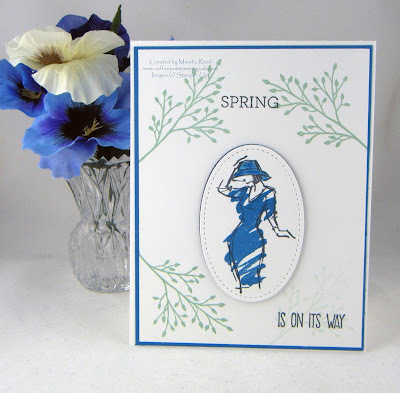 From the Sunshine Sayings stamp set, I stamped two sentiments onto Whisper White using Basic Black Archival ink. Then, I added a line of Rhinestone Basic Jewels to each label and one to the large Sweet Sugarplum heart. Here is a close up of the what the Radiant Rain Shimmering Mist looks like. I sprayed the entire front of the card with it so it has a very pretty shimmer to it. The them of hearts is from the Just Us Girls Challenge. For all the challenge details and to share your project, click the image below. The theme of love is from the CAS Watercolour Card Challenge. For all the challenge details and to share your project, click the image below. It's just a short post today. I've been rather under the weather all week long and am just now starting to feel normal again. I've found that being on the computer makes everything worse so I'm limiting my time to a short duration. Here's the card I made for The Flower Challenge where we were to CASE (Copy And Share Everything) the Guest Designer. My card was entered in The Flower Challenge. For all the challenge details and to share your project, click the image below. For the butterfly, using the Butterflies Thinlits Dies, I cut one from Bermuda Bay, one from Tangerine Tango and one from Whisper White. 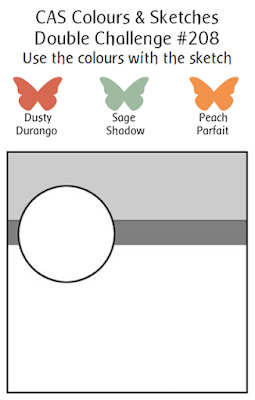 Using a blending tool, I blended color over the Whisper White butterfly. I used Bermuda Bay and Tangerine Tango ink. Then, I covered it with VersaMark and heat embossed it using Clear Embossing Powder. After embossing, I glued the three butterflies together. I used Bermuda Bay sequins on the body of the butterfly to add more dimension. For the card base I used Whisper White Thick cardstock. 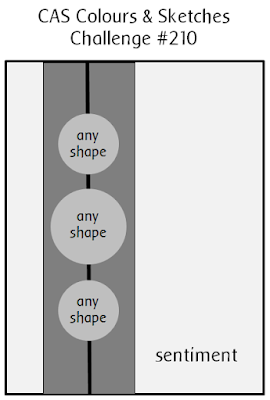 The rectangle layer was made placing a piece of Whisper White over a piece of Basic Black. The two small banners were punched from Bermuda Bay and Tangerine Tango using the Triple Banner Punch. The sentiment from the Jar of Love stamp set and the antennae from the Papillon Potpourri stamp set were stamped using Tuxedo Black Memento ink. For all the challenge details and to share your project, visit Freshly Made Sketches Challenge and Color Throwdown Challenge by clicking the images below. 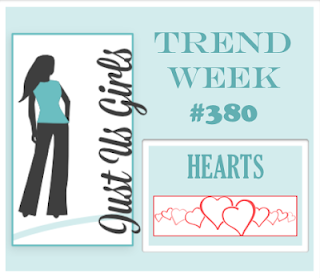 This week it's a color challenge at the Watercooler Wednesday Challenge. As host this week, I thought some springlike colors would be a nice change to the snowy, wet, cold winter days many of us have been experiencing. 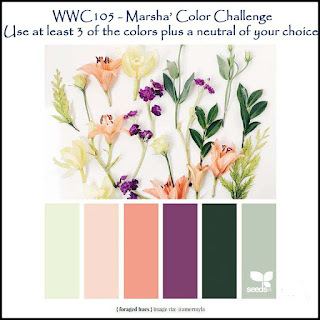 Whether you make flowers is up to you as this is a color challenge and the only requirement. I was in the mood for flowers as I am so ready for Spring. My card starts with a Very Vanilla card base to which I added a strip of patterned paper from the Serene Scenery Designer Series Paper Stack. 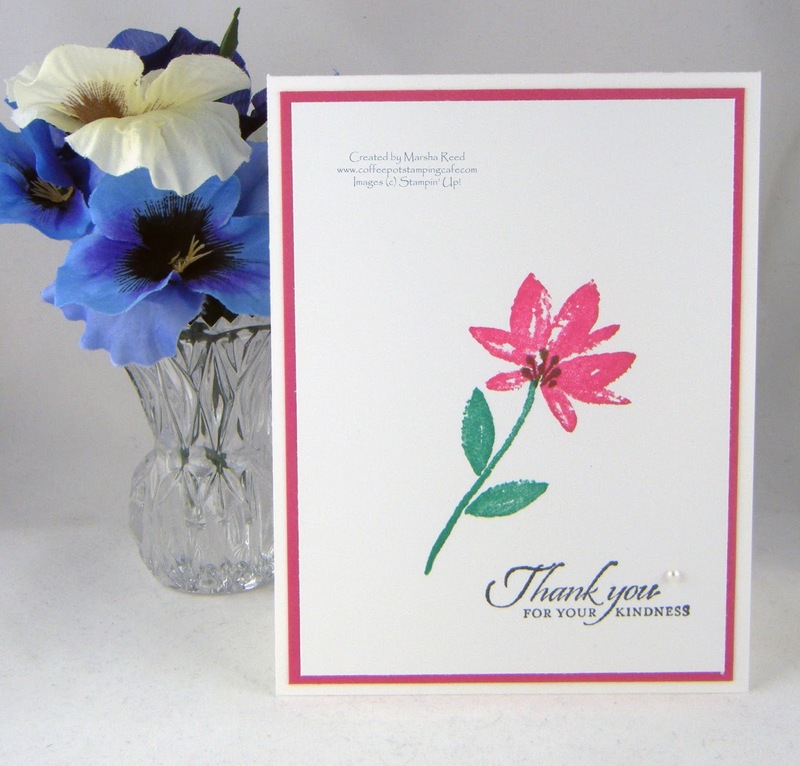 The flowers and leaves were cut using the Botanical Builder Framelits Dies. For my colors, I chose Flirty Flamingo, Peekaboo Peach and Rich Razzleberry for the flowers. For the leaves, I chose Mint Macaron and Mossy Meadow. On the Mint Macaron leaves, I stamped an image from the Botanical Blooms stamp set. To the center of each flower I added a Metal Rimmed Pearl. 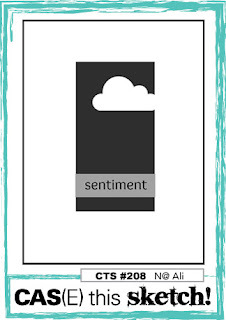 The sentiment is from the Rose Wonder stamp set and is stamped in Basic Black Archival ink. For all the challenge details and to share your project, visit Watercooler Wednesday Challenges by clicking the image below. We'd love to have you join us. You have until Monday, February 13th at 6:00 p.m. Central Time to link your project. It's so exciting to be able to share with you that I was selected to be a Guest Designer for the month of February with the CAS Colours & Sketches Challenge. I love challenges and to be asked to design for them for a month is such an honor. This week it's a color challenge with some of my favorite colors. The flowers were cut using the Tattered Florals Die by Tim Holtz. I used Cherry Cobbler, Rose Red and Sweet Sugarplum for the flowers. The branches were cut from Smoky Slate using the Leafy Branch Die also by Tim Holtz. I attached them to the Whisper White mat layer using Tombow Multipurpose Glue. 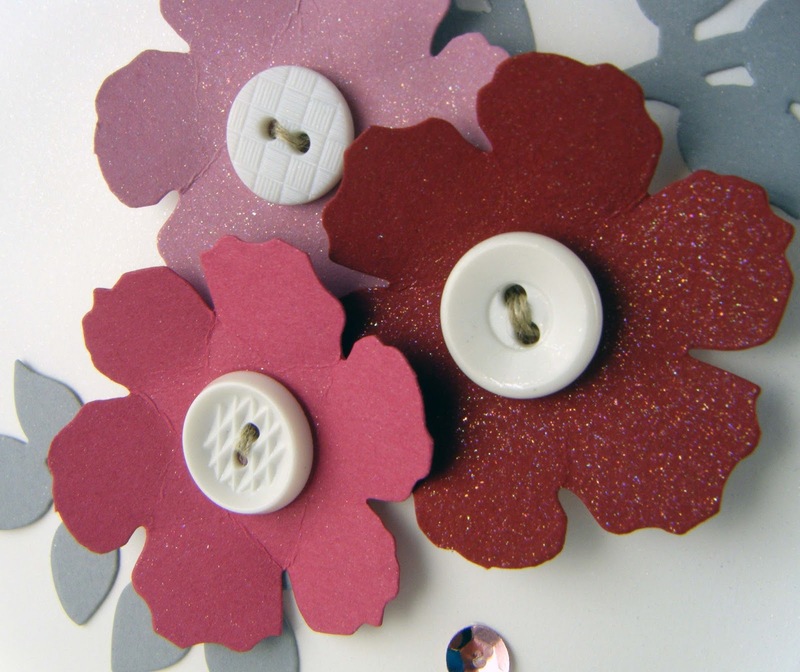 The white buttons each have a piece of Linen Thread threaded through them then, they were attached to the center of the flowers using Glue Dots. 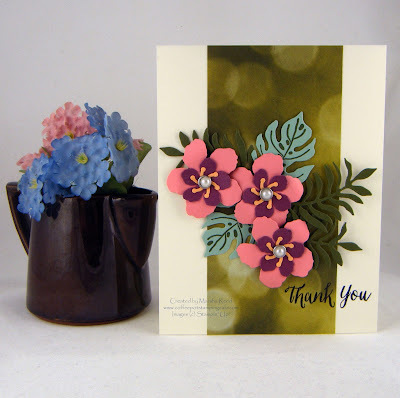 The blossoms were attached using Stampin' Dimensionals. 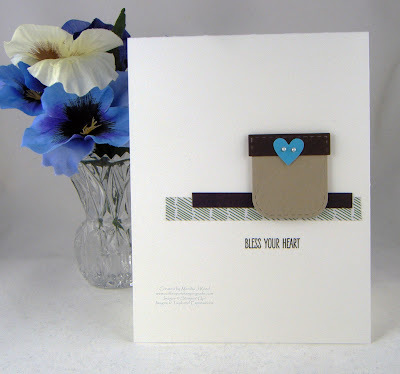 The sentiment is from the Jar of Love stamp set and stamped in Tuxedo Black Memento ink. To the layer I also added three Sweet Sugarplum Fancy Frost Sequins. 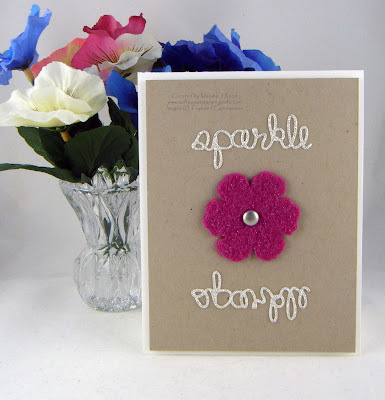 For the finishing touch I sprayed the card with Radiant Rain Shimmering ICE Mist by Splash of Color. 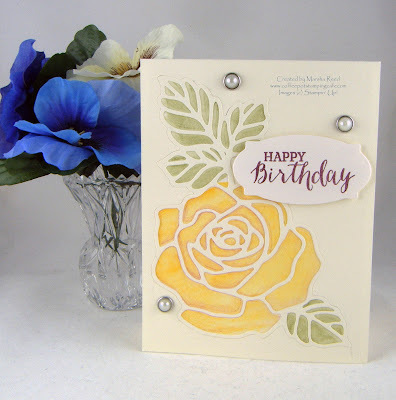 The mat layer was attached to a Whisper White Thick card base using Stampin' Dimensionals. The Shimmering Mist doesn't show up well in the photo so here is a close up to give you an idea of what it looks like. If you click on the image below, it will open it up so you can get a better view of how pretty and shimmery the flowers look. 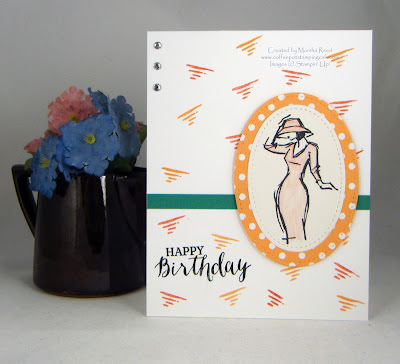 While my pizza is baking, I have time for a short post to share the card I made for the current CAS Colours & Sketches Challenge. I found I had all the colors, in one form or another, that I needed for the challenge without having to find a close match. Yes, I was surprised. The card base is Shimmery White. I found a piece of Peach Parfait cardstock and embossed it with the Vintage Wallpaper Embossing Folder. The ribbon I added is actually the 5/8" Whisper White Organza Ribbon that I used my Dusty Durango Stampin' Write Marker to add color. I think it looks really well with that Peach Parfait. Don't you? 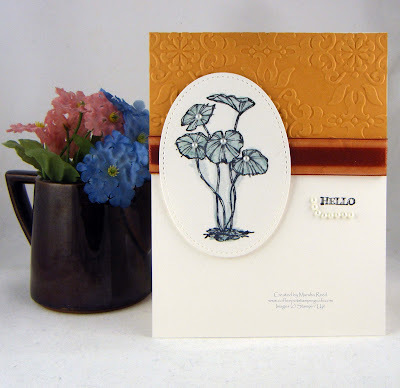 I stamped an image from the Fabulous Flora stamp set in Basic Black Archival ink onto a piece of Shimmery White and watercolored it using a Sage Shadow Watercolor Wonder Crayon. Then, I cut it out using one of the ovals from the Stitched Shapes Framelits Dies. The sentiment is stamped in Basic Black Archival and is also from the Fabulous Flora stamp set. When I stamped the sentiment, it left a bit of a mark where you see the line of Pearl Basic Jewels. It was one way to cover up the mistake and not have to start the card over. I think it worked rather well. I also added a pearl to the leaves in the image to finish out the design. The colors and sketch I used are from the CAS Colours & Sketches Challenge. For all the challenge details and to share your project, click the image below. 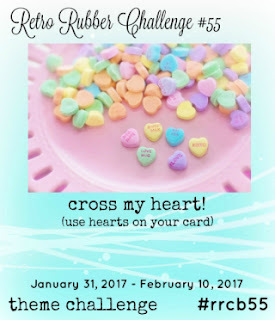 This week at Watercooler Wednesday Challenges, Kath is hosting a sketch challenge and she's chosen a very nice one. It gave me a great opportunity to use those Stitched Shapes Framelits Dies along with the new Beautiful You stamp set. Her dress was watercolored using the new Watercolor Pencils. 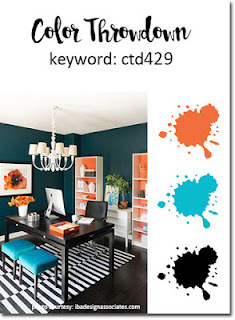 The color I used is Calypso Coral. It's a pastel version of Calypso Coral due to the water coloring. I'm going to love having those watercolor pencils. For all the challenge details and to share your project, visit Watercooler Wednesday Challenges by clicking the image below. We'd love to have you join us. You have until Monday, February 6th at 6:00 p.m. Central Time to link your project.